Once upon a dinner we ordered spring rolls for an appetizer, and not only did they nearly break the bank (SEVEN DOLLARS!? ), they only gave us two. Pshh. Ridiculous. Things this delicious should come in bulk. Moreover, things this easy should be recreated! And recreated they have been. We don’t know why we were so shocked at how easy these are to make. It might have something to do with the initial money we forked out for them, but dang, are these easy to make. Healthy, too. Now all you need to do is practice your rolling techniques. Mince three cloves of garlic and place in bowl. Add and mix equal parts (in this case 1/2 cups) peanut butter, soy sauce, and sugar in a bowl. Add desired amount of hot sauce and lime juice. Thinly slice up all of your veggies and fruit. A grater works very well for thin slicing. To make the spring roll wrappers, you will need a large bowl of water. Submerge the wrappers until they become malleable and flimsy. Allow wrapper to sit for a few seconds and become sticky before filling with ingredients. Meanwhile, place another wrapper in the bowl. 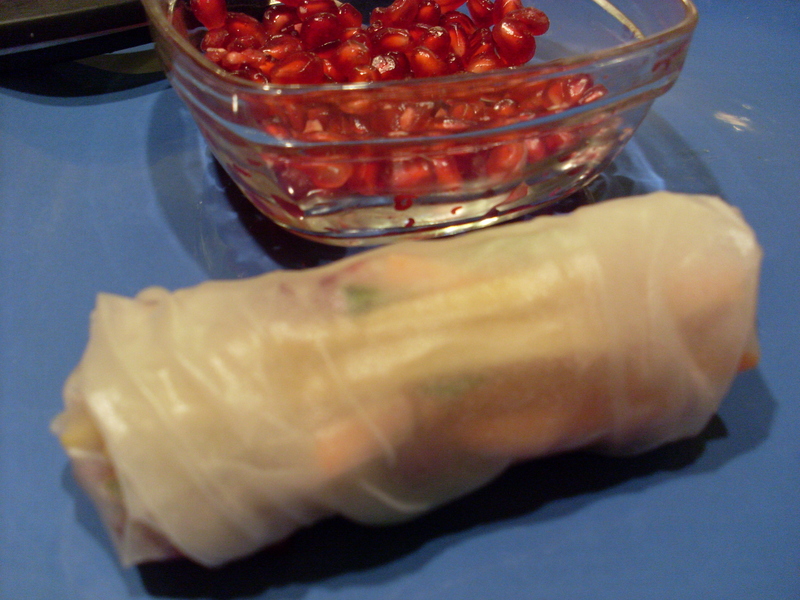 Dip your spring rolls in that awesome sauce and have a pleasant meal. We (Nina and Nancy) are both college seniors who love to feast. Seriously. We love food. We love to eat it, we love to cook it, and we love discovering new recipes… and then modifying them to make them cooler than awesome. In order to keep track of them all we decided to make a blog. Lucky you. So get your spatulas ready, we’re starting a new escapade.